Russian Russian company Awesomatic Games is still new to the creation of MMORPG toys, but has already gained fans who liked the game Skyburg. This is really a stylish, charismatic product in the style of steam-punk, in which the most important means of transportation is the airship, and scientists experiment on donkeys with psychotropic abilities. Before you open the world with flying cities, mutants and zombies post-apocalypse, but which is presented not in a gloomy atmosphere, but with humor and in a cartoon style of drawn comics. Well, what is your strength? It depends on you whether you can pass through the Lake of Death, teeming with terrible zombies, and avoid death. If in the city of Skyburg opponents are equal in strength, then outside of it you will need maximum luck and lives to set the heat of any evil spirits. To win every detail is important: how many soldiers are hired, how they are placed on the site, what skills to use. In order to play in Skyburg, you do not need to adhere to the line of conduct established by the plot. All steps are your decision. Even if you need to perform a specific task, only you decide how to do it. After the skirmish, look in more detail what losses the enemy suffered, what you are, and immediately recovered trophies are seen. 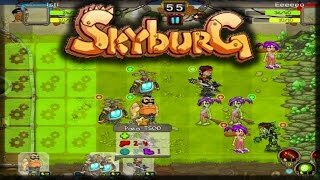 But since your opponents are real players, there will be a Skyburg registration that will turn you into a resident of the heavenly town of Skyburg. Select defense points and distribute units on the battlefield: donkeys, rock guitarists, television robots with propellers, jelly and three-eyed creatures and others. When the signal to the beginning of the battle is given, you can no longer control the characters and change something. They will act independently, and you only observe the situation, unable to change anything, even if you see your own mistake in the alignment of forces. Skyburg iPlayer is designed in such a way that it can be played, in addition to the computer, on tablets and mobile phones. Developers continue to correct errors, constantly improving the product and working for the future. It may take a little time, and the browser strategy will be replenished with new characters and features. But now she is just gorgeous. It's nice that you do not need to understand the features and management for a long time, register, go in and play at your pleasure. And there is something to receive pleasure from: beautiful graphics, original style, a variety of actions, unobtrusive humor.